IN New York City, it is more than a notion to get a kid competently educated without money and, if said kid is a black male. This is the thesis of “American Promise,” a documentary by Brooklyn filmmaking couple Joe Brewster and Michele Stephenson. They follow their son and a classmate from enrollment at the Dalton School through graduation. It has its U.S. premiere today at The 51st New York Film Festival. (See video at top). 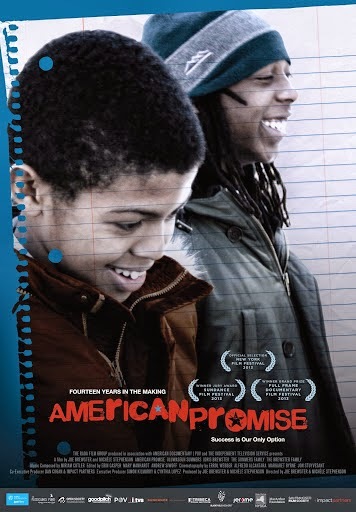 Bound for the education circuit and PBS, “American Promise” is illuminating and disturbing, even as it fails when it insists on making practically every obstacle facing Idris and Seun about race when it is not. Elsewhere at NYFF51, in its world premiere this evening, is centerpiece "The Secret Life of Walter Mitty." Director Ben Stiller also stars as the title character in this tale with tenuous ties to a James Thurber work. Along for the journey in what is a touching fantasy-filled love story is Kristen Wiig as the elusive love interest of the title character.